I woke up unsure whether I was going to go on today’s trip. I had been up a lot of the night unwell and hadn’t kept a proper meal down since Thursday so was starting to feel a bit weak and pathetic. I decided to try some breakfast and decide after that. Breakfast was fit for a king. By far the best spread we have had in a hotel so far, I felt let down that my stomach wasn’t onside to have as much as possible of this beautiful feast but I chowed down what I could. As usual for my roomie and I, we were running behind so I put no thought into how I was feeling and decided to run down with my bags and hop on to our transport to the port! Our transport was such fun! We all suddenly became massively competitive despite not cycling it ourselves….Don’t worry ours won!!! 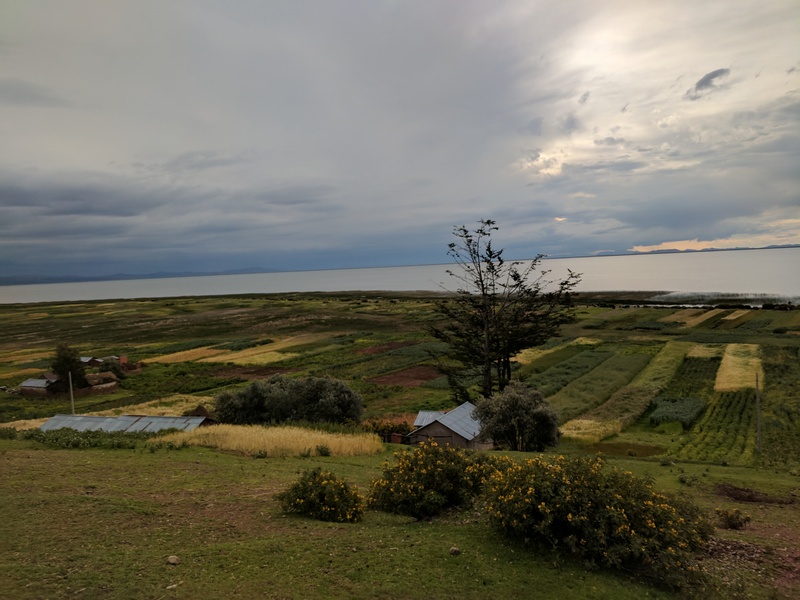 At the port we bought the last bits we needed and hopped aboard our boat to head out onto Lake Titicaca and to go to our first stop, the floating islands of Uros. The boat was very spacious and after half an hour we were allowed to adventure up on deck. Cheesy pictures followed of course. 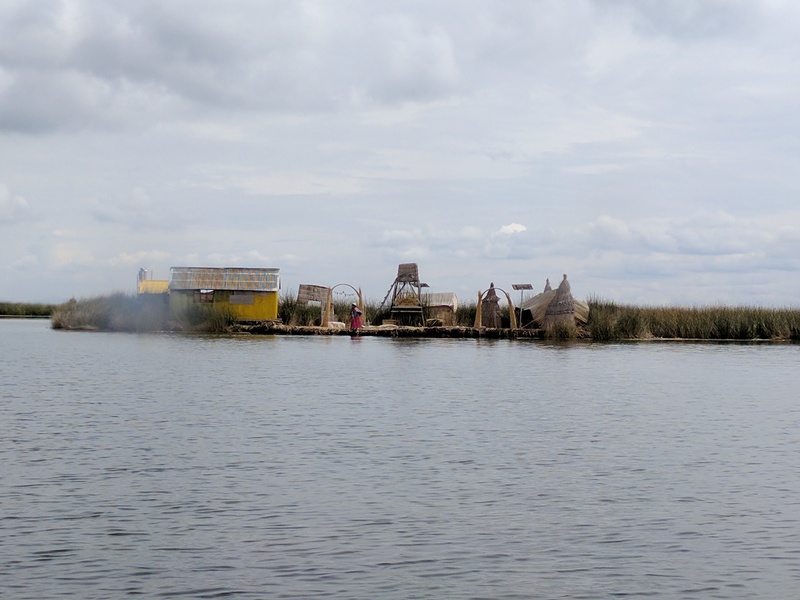 After just over an hour we arrived at the floating islands of Uros. The islands are manmade from reeds. As you step on them, you can feel the movement and there are sinking patches on the island. The island we went to housed six families. Everything you could see was made entirely from reeds, the houses, the boats, the floor! It is so different from any lifestyle you could imagine. We were invited into one of the family homes which housed four people and had a chat with the lady of the house. It is such a stark contrast to the luxury we are used to. We were taken out on one of the reed boats and were given reeds to try. I was a little unsure whether to try or not with how unwell I’ve been feeling but I figured what the hell!!!! The texture was very like celery and if I wasn’t so accustomed to sweet foods I would have said it had a slight sweet taste. Apparently the children have the end of the reeds as sweeties! On return to the island, people started to look round and return to our boat. I took a moment to sit and take in the islanders. It was then that one of the little girls came over and started to play with her toy with me. It was a truly special moment and made me think of my beautiful niece at home. 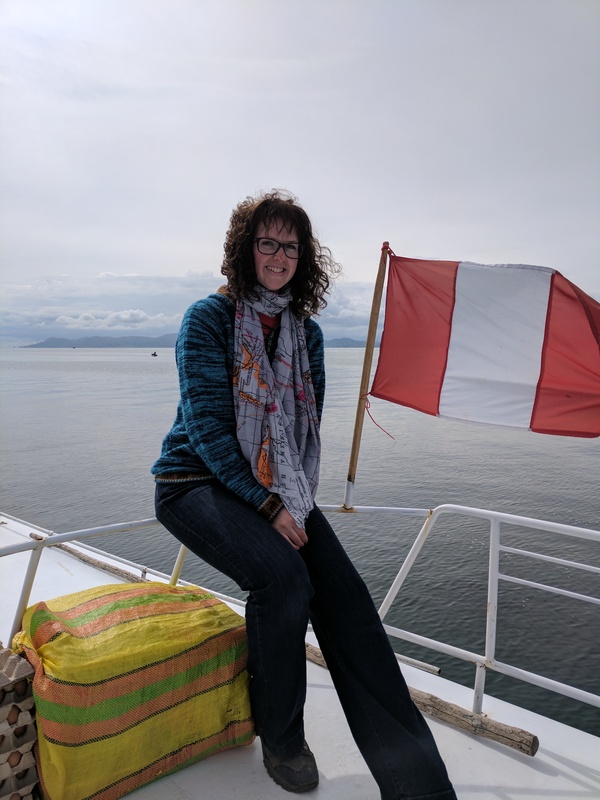 The next stop was Taquile island (Sunflower island) and I am sure it was made to kill me! 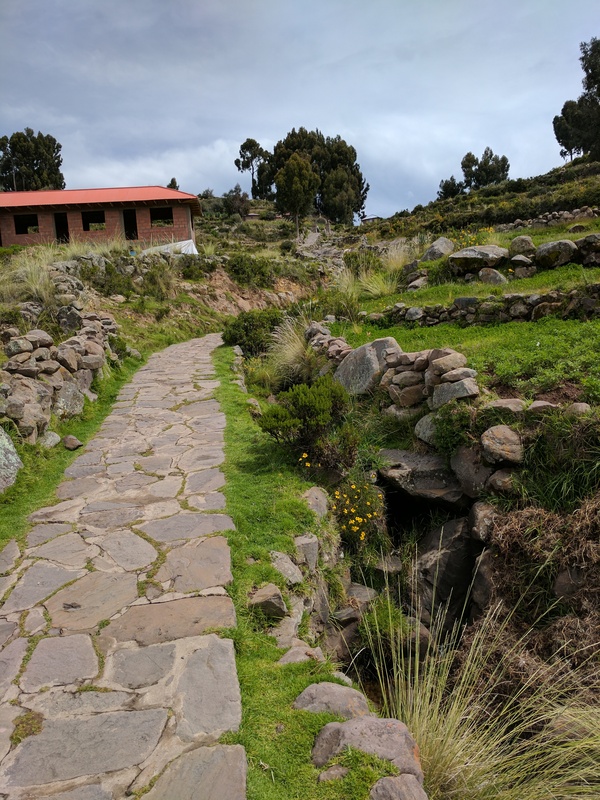 The path up to the main square was like looking at a stone wall…Almost completely vertical, so vertical you couldn’t see the top. I almost felt like sitting in the boat! 20 minutes later (I may be being generous there….) we were at the square and enjoying the view. I was totally ready for lunch so when they showed us to a table I could have fallen down onto my knees in thanks! 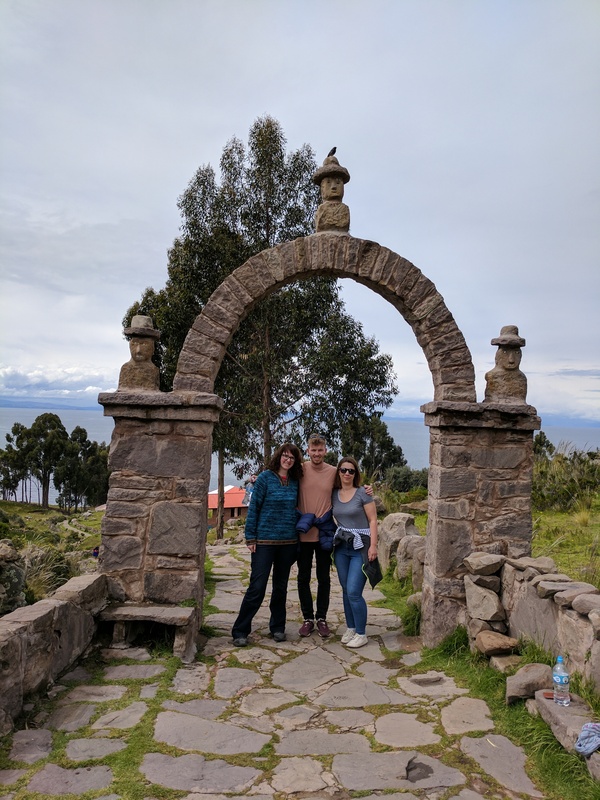 We were given the local traditional bread which was delicious and I think I ate a whole loaf to myself….This was accompanied by a spicy salsa which was of course delicious and my new favourite quinoa soup. I could have died then and there a happy, contented and very full woman but then they bought out the next course – rainbow trout. Man oh man was that tasty. I squeezed in what I could and worked on rolling myself back to the boat. Back at the boat we started making progress towards our honestly island when the engine conked out. My luck was following me again! The boat had broken down…. After much vicious swaying (I’m pretty sure my trout thought it was back alive and swimming in the lake again!) and loud noises, we were back in action and on our way again. An hour later we arrived at the island in the rain to meet our hosts. My roomie and I were paired together with a host called Jesus. He walked us from the port up to his house. I swear they looked at me, laughed, then paired me with the guy who had the highest house on the island!!!! It took 20 minutes to walk there with our luggage and I was puffing away like a little soggy steam train. It was worth it though. Our room is beautiful and the view is even more so. 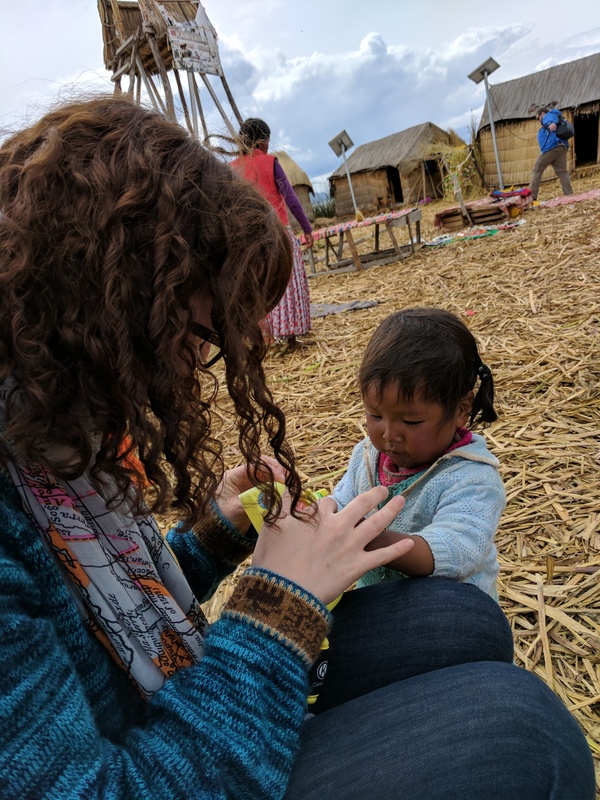 Jesus and Natalya, his wife, speak Spanish, Quechua and Aymara so communication is a little tricky. Luckily Christine speaks more Spanish than I do so we are getting by! 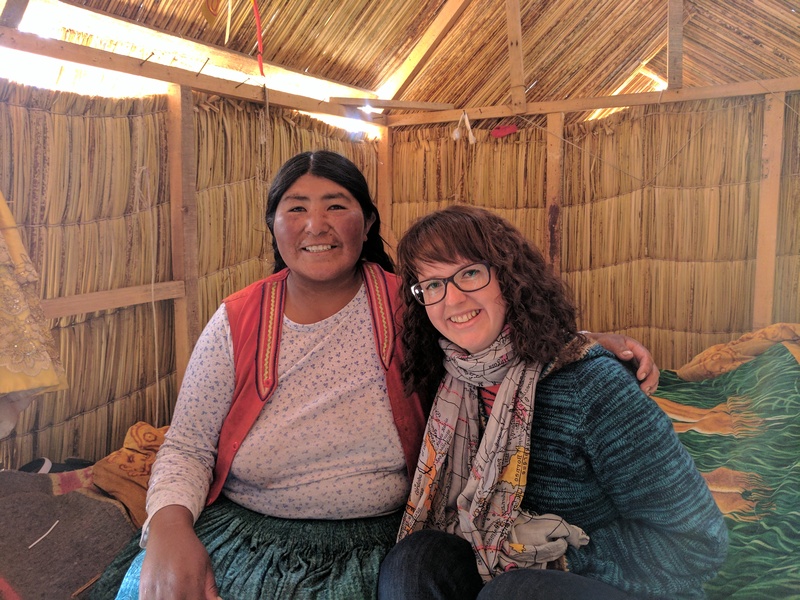 We had dinner with them in their kitchen – a lovely soup and some rice and vegetables followed by coca tea. 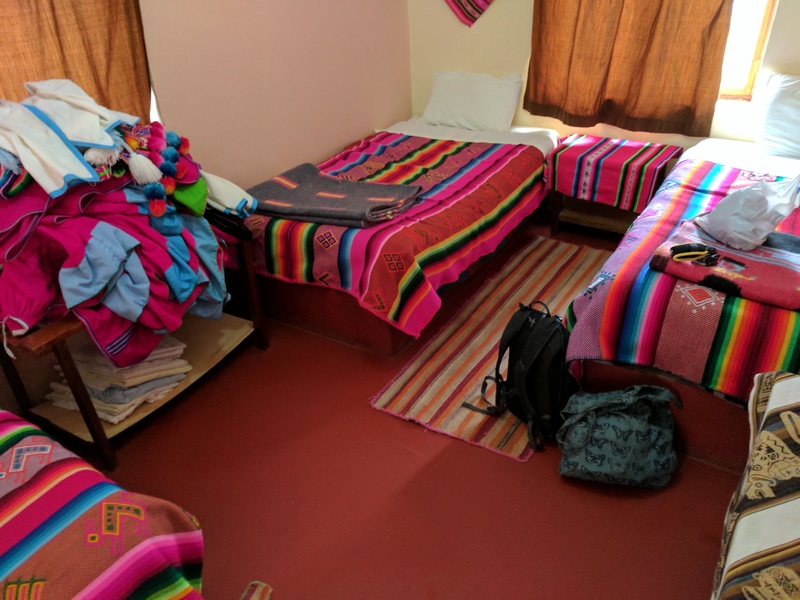 We were then taken to our room to relax for the rest of the night. 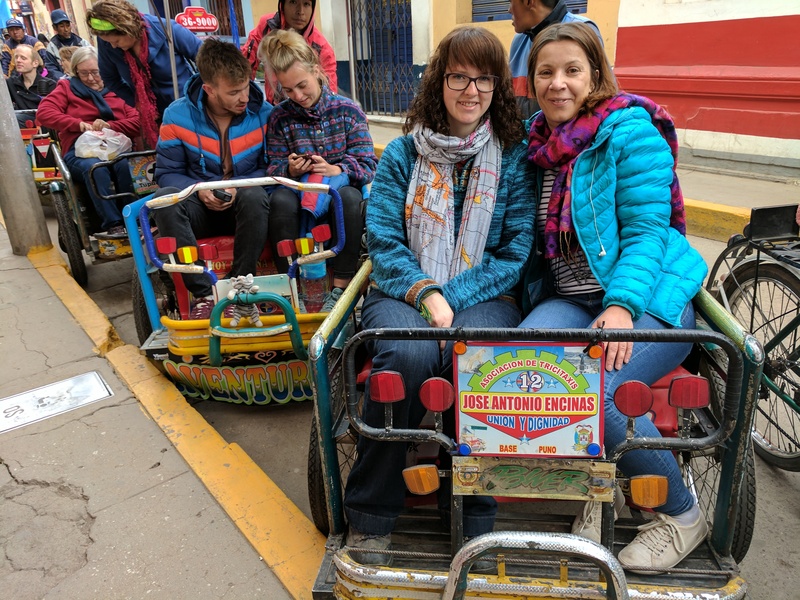 Christine​ and I had other ideas about relaxing and had a little practice fashion parade in readiness for tomorrow and trying out the Peruvian clothing. I think we are ready.